George Bye has been crafting and testing electric aircraft for the last decade and now has four craft of varying size demonstrating the reach of his vision. Bill Moore interviewed George for EVWorld.com recently. We’ll review the airplanes with which George is involved, starting small and working up to a spectacular cross-country cruiser. Although the UAV company associated with the Silent Falcon is not part of Bye Aerospace, it had its origins there. Now located in Albuquerque, New Mexico, Silent Falcon operations are overseen by John Brown, former Chief Financial Officer (CFO) for Bye Energy. Silent Falcon’s glider-like 14-foot wing, high efficiency airfoil, electric power and high-efficiency solar cells allow up to five-hour surveillance flights. Its ability to carry a large contingent of cameras, sensors and mapping systems make it a good candidate for ISR (intelligence, surveillance, reconnaissance) missions in civilian or military operations. Modifying a Windward Performance Duckhawk sailplane with an as yet unspecified motor and battery pack, StratoAirNet will fly an optionally piloted craft capable of medium altitude long endurance (MALE) performance. 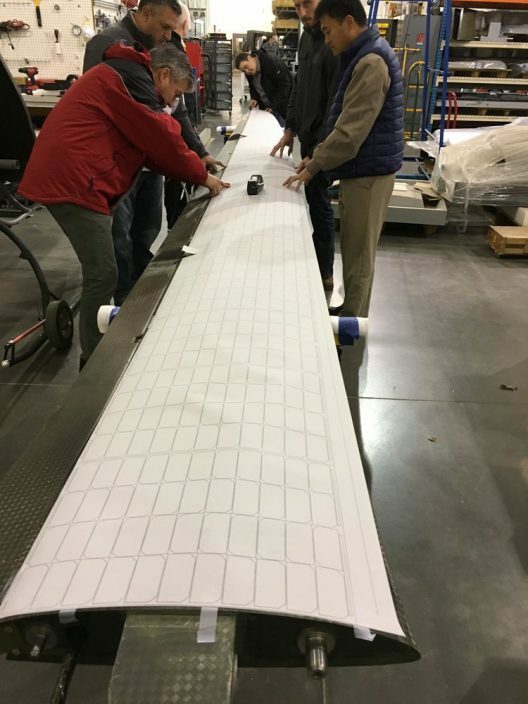 Initially flying with a standard class sailplane wing (15 meters or 49.2 feet), the airplane might grow to 84-foot span. The larger size of StratoAirNet over that of the Silent Falcon will enable extended ISR missions in both civilian and military modes. Sun Flyer has own corporate identity, a far cry from George’s initial attempts at motorizing a Cessna 172 several years ago. 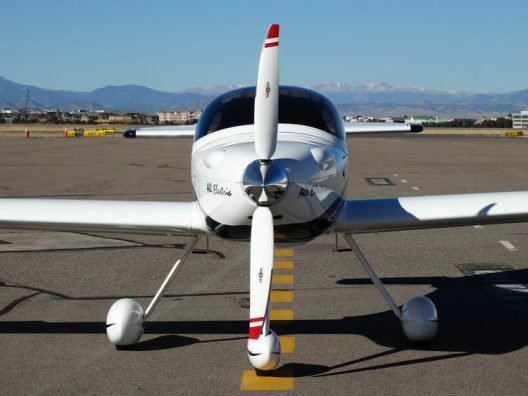 The current two-seat trainer benefits from better motors, controllers and batteries and is “very close,” to first flight tests in April or May. George has been in negotiations with the FAA for the last few years and feels his trainer will be certified by the agency, a first for private electrical aviation. The first prototype’s airframe was built in Tennessee and shipped to Denver where it has been fitted with its motor, batteries and instrumentation. Motor instruments are unique because they monitor Amps and Volts rather than the normal fuel flow, temperature and pressures of a gasoline engine. Bill Moore asked about cabin heat, because an electric motor is 95-percent efficient and therefore throws off only five-percent waste heat. Internal combustion engines can keep an airplane cabin toasty even at altitude because the best of them release 70-percent waste heat. George noted that even that five percent is enough to maintain comfort, but that for very cold climates, the airplane will have an electric heater to supplement that. He envisions modular electric heating and air-conditioning unit options. One concern remains, though, the reduction in aircraft range from running electrical add-ons. Perhaps the solar cells will offset that concern. With orders for over 100 airplanes and ongoing cooperation with the FAA, George may indeed be the first to have a small fleet of electric training aircraft in the skies by 2018. Ambitious as these three projects are, they pale in comparison to the XTI-Tri-Fan, a five passenger (one pilot) hybrid vertical takeoff and landing (VTOL) cruiser. Because of its size and performance, the airplane uses an electric hybrid turboshaft combination, batteries not providing the necessary energy, despite their increasing performance. XTI has 700 investors who’ve helped underwrite this though a crowd-funding program. A two-thirds-scale prototype XTI will be powered by a Honeywell HTS900 turboshaft engine, driving a generator to power the electric ducted fans for vertical takeoffs and landings, and helping provide thrust for horizontal flight. The third fan, mounted in the aft fuselage, does not pivot, but has sliding doors, top and bottom, to streamline it when the Tri-Fan is in forward flight. Now going through the normal development phases of mockups and prototypes that lead to test aircraft, with Bye providing engineering capabilities and power system development, the airplane is about five to seven years from production. Tri-Fan can conduct all missions that helicopters normally fulfill, and has the speed and range of light bizjets. The pressurized machine can take passengers 500 miles in VTOL mode, over twice that in conventional flight mode, while cruising in the 300 mph range. Looking beyond terrestrial ambitions, George sees possible flights on Mars, with specialized aircraft designed for the thin atmosphere making solar-powered, long-range surveillance flights. Mars’ cold and thin “air” actually add to the efficiency of the solar cells, so even further removed from the sun than on earth, they could provide the necessary energy for extended flights. George Bye has been exploring electric aircraft sustained by sunlight for over a decade. His efforts are finally beginning to reflect a new reality and a dawning hope for future clean flight.